His many "standards" confirm Irving Berlin's status as this century's premiere American songwriter. But this fall, two exciting new projects will be released - a two-CD compilation album and a songbook - based on the songs of Irving Berlin that people don't know. Whether they were unpublished or unsung, the existence of these songs has long held fascination to the casual fan and Berlin scholar alike. Here, Theodore S. Chapin discusses THE LOWER EAST SIDE SONGBOOK and UNSUNG IRVING BERLIN. When Stephen Holden of The New York Times met with Irving Berlin's three daughters prior to the announcement of our administration arrangement five years ago, one of his first questions was: "What about your father's unpublished songs?" This was not a question the Berlins expected to hear right off the bat and, since the meeting was about everything their father wrote in his lifetime, they really hadn't formulated an answer yet. But it was a good question and were it asked today, two of our newest Berlin projects would begin to provide the answer. When Irving Berlin died at the age of 101, he left the keys to his particular kingdom in the hands of his three daughters and The Morgan Guaranty Trust Company of New York. For the final twenty years of his life he let only a very few people into his inner sanctum. For purposes of business, his family was not included. Certainly they saw him at holidays and special occasions, but I would venture to guess that never once was there a conversation in which he said what he did or did not want to happen with his songs upon his death. Therefore his legacy was left in the hands of caring people who had to find their own way in uncharted waters. They approached us here at The Rodgers & Hammerstein Organization to see if we couldn't work together on managing the copyrights in an effective and efficient way. (See Happy Talk, Vol. 1, No. 2) Part of the task was clearly, "What would Irving Berlin have wanted?," but as time went on that became more "What do we all think should happen?" In order to assure a bright future for the extraordinary catalogue of songs written by Irving Berlin, making the catalogue accessible and available was the first task. 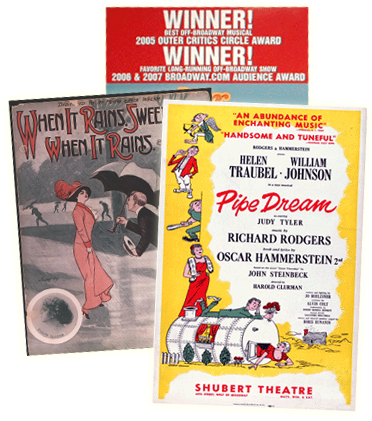 140 of the best-known songs were featured in the six-book Songs by Irving Berlin, published by Hal Leonard in 1991. An anthology followed, which includes 60 of the most well-known titles. The Berlin catalogue started to enjoy a higher profile, but questions about those unpublished and unknown songs kept lurking in the background. What were they? How many were there? Were they any good? Were they worth pursuing? To find out, we dug into the files, hired a pianist, and spent two or three days just listening. We were fascinated. We heard a wide variety of material: songs cut from musicals we know, songs written for musicals that were never finished, priceless comic gems, oddities and personal musings which appear to have simply been written when the mood struck, etc. Out of the early years came Irving Berlin's Lower East Side Songbook. We became intrigued by the ethnic songs and decided to publish a book of our sixteen favorite, ranging in mood from the merely curious ("How Do You Do It, Mabel, on Twenty Dollars a Week?") to the outrageously indignant, as immortalized in "If You Don't Want My Peaches, You'd Better Stop Shaking My Tree." We asked Charles Hamm, a scholar who has written more about Irving Berlin's early years than anyone, to annotate the book and place the songs in context. Irving Berlin's Lower East Side Songbook will be available this fall. So early Berlin songs would have a chance to be heard again. But what of those songs that had never been heard at all? When Symphony Space in New York decided to devote one of its twelve-hour WALL TO WALL marathons to the music of Irving Berlin (see Happy Talk Vol. 1, No. 3), it seemed like a logical place to introduce some of the unpublished material. A half-hour was dedicated to the trunk songs and, in a day already crowded with memorable moments, it proved to be one of the highlights. Along came Bruce Kimmel of Varse Sarabande Records, who was intrigued enough to ask if there were more where they came from. There were, and we decided it was time to take the plunge. The two-CD album, entitled Unsung Irving Berlin, will also come out this fall. Featuring such talents as Laurie Beechman, Davis Gaines, Emily Loesser, and Berlin's granddaughter, Mary Ellin Lerner, UNSUNG IRVING BERLIN covers eight decades of material, including songs written for the never-completed stage musical STARS ON MY SHOULDER and the unproduced movie musical SAY IT WITH MUSIC. An accompanying songbook will follow early next year. As I write this, I realize how extraordinary the collaboration between The R&H Organization and the Irving Berlin interests has become. Creative geniuses who leave copyrights to their heirs are not necessarily handing over something easy to deal with. If you inherit paintings and houses, you decide whether to sell them or keep them. Period. If you inherit copyrights, however, you deal with such issues as whether Macaulay Culkin mimicking the Drifters' version of "White Christmas" in HOME ALONE is a good idea, whether an obscure show is due for revival, or how to respond to the latest inquiries along the information superhighway. These are judgement calls, as is the decision to release unpublished and unknown songs. If everything is fueled by one thought, it is the preservation and continuation of a great legacy. I have always contended that the more people hear music by the great songwriters, the more they will want to hear.